Bluesound multi-room system review | What Hi-Fi? With its five-star First Test still fresh in our minds (October 2014), we have high hopes for the high-res capable Bluesound. Could this be the multi-room solution that hi-fi fans have been waiting for? The choice of products is small, but complete, comprising the Powernode (£600), an amplified streamer; the Node (£400), unamplified for hooking up to an existing system; and the Pulse (£600), an all-in-one speaker. There is also the Vault (£900) – an all-in-one music streamer and CD ripper with 1TB of storage, as well as the Duo (£900) – a 2.1 speaker package. The Bluesound range is aimed at those who value audio performance above all else, but who also want a good user experience. After getting each component out of the box and powering it up, the first thing to do is get them onto your home network. The quick-start guide walks you through this, with the LED on the top-mounted mute button glowing solid blue once it’s successfully connected. You will need to repeat the process for each component – there’s no quick pairing method between speakers at the moment, but it doesn’t take long. Unlike Simple Audio’s Roomplayer+ or Samsung’s Shape Audio set-ups, there’s no requirement to hardwire any part of your Bluesound set-up (except for the Vault, if you have one) in order to go multi-room. However, if you stream lots of high-res audio we’d recommend the more stable hardwired connection. There’s a free iOS and Android app to control each product in the range. As long as your mobile device is on the same network as your Bluesound players, the app will automatically show them as available for streaming music and allow you to group them together. It will also help you pull in music from NAS drives on the same network, as well as access some of the most popular streaming services (including Spotify, Rdio, Deezer, Qobuz and TuneIn Radio). Bluesound picks out our NAS easily, and displays its contents and artwork under the ‘local library’ tab on the app. We have some indexing issues with some of our WAV files, but that’s a common problem we’ve stumbled across in similar systems. We’d recommend saving your music as FLAC files if you want to ensure the most accurate indexing. A wired connection will index around 1000 songs per minute – wireless will take a little longer depending on your connection but, once done the first time, re-indexing is much quicker. Listening to the Pulse, it is one of the most ‘hi-fi’-sounding speakers of its type we’ve ever heard. It offers up a considerable amount of detail and there’s spaciousness to its presentation that we aren’t used to from a one-box design. It’s powerful too, making Sonos’s Play:5 sound weedy in comparison. Stream a 24-bit/96kHz resolution file of Fleetwood Mac’s Dreams and the Pulse shows it’s no slouch, with the rich bassline proving to be as agile as it is weighty – the rhythmic drum intro punches with precision and impact. The Powernode, paired with a pair of Q Acoustics 2020i speakers, is for obvious reasons capable of a bigger soundfield and better stereo separation. But otherwise it demonstrates the same attention to detail and dynamic wherewithal as the Pulse. They’re both exciting and engaging to listen to, and they don’t lose their enthusiasm when we move to lower resolutions and start streaming via Spotify at 320kbps. Of course, you’ll hear a drop in detail as can only be expected at this level, but it doesn’t stop it being a really listenable and likeable character. We play Kanye West’s Power and the Bluesound system bursts into life, carrying the stirring instrumental with attitude and drive and demonstrating clarity across the midrange that picks out every nuance in West’s expressive vocal. The bass, although less defined here, is still solid and punchy. 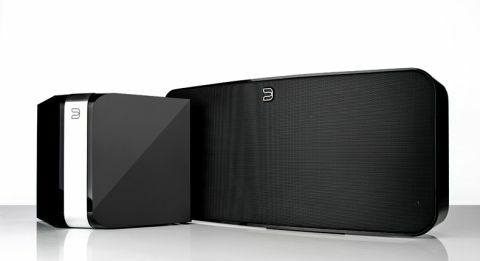 Bluesound is one of the most musical multi-room systems we have heard. Its high-resolution capability is its strength, of course, but just as importantly it’s easy to set up and use. Multi-room audio has never sounded so good.